Bumrah spent most of 2018 bowling remarkable Test match spells despite being an experimental pick in the format for India. Though he played only one first-class match in 2017, he showed flashes of aptitude and bowling intelligence in the long format in 2018. Firstly, a tremendous fitness regime kept him in shape for Tests, despite what many suspected would be an unsustainable action in the longer format. Second, he showed nous in varying conditions and took his first two five-wicket hauls in India's only wins in South Africa and England. His third, and best, came in India's last match of the year. After two closely fought Tests, the Boxing Day Test in Melbourne began with India's 443 for 7 declared taking nearly 170 overs. 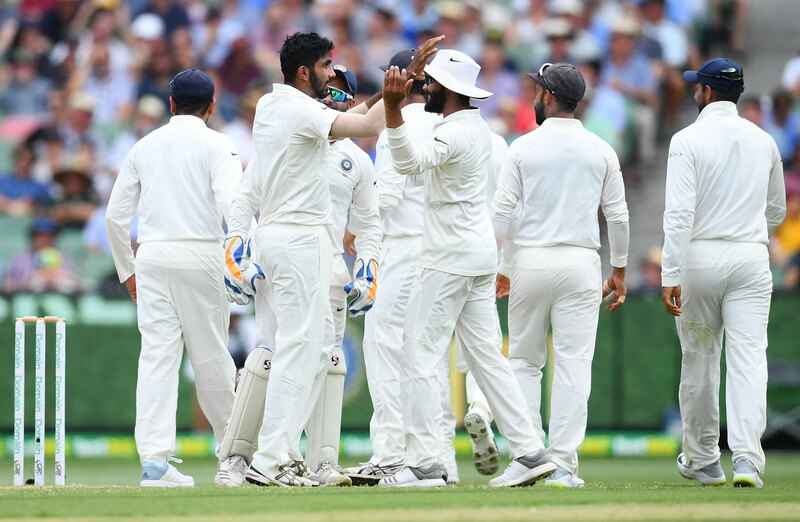 Amid rising suspicion that the MCG had not improved on the dud pitch that was served in the Ashes, Bumrah produced a spicy spell that ended all talk of the pitch and gave India a significant first-innings lead. Bumrah produced relentless pressure through the course of the innings, and he managed wickets with practically every possible method for a fast bowler: a bouncer, three searing full deliveries, one slower yorker, and a late away-seamer from a good length. They were six wickets that spelled out his development through the year, six wickets that gave India a 292-run lead and, like Agarkar's six in 2003, the wickets that put India in position for a historic win. Bumrah's spell peaked at the stroke of lunch on day three. The ball had gone soft and Australia's fourth-wicket pair, Shaun Marsh and Travis Head, had stabilised the innings as batting conditions eased out. Last ball before the interval, Bumrah decided to bowl a slower yorker, one of his trademark deliveries in the shorter formats and suggested to him on the day by his Mumbai Indians captain, Rohit Sharma. It caught Marsh completely unawares - dipping in at middle and leg from around the wicket and trapping him leg-before. Any encouragement Australia took from that partnership was blatantly blown away before lunch, and they were bowled out for 151. 3 India have won all three times when Bumrah has taken a five-wicket haul in Tests. 49 If the fourth Test hadn't been washed out, Bumrah was in sight of becoming the joint second fastest to 50 Test wickets for India, equalling Anil Kumble on ten Tests. Bumrah could equal Harbhajan Singh and Narendra Hirwani if he does it in his 11th Test. No other Indian fast bowler comes close to this fast for 50 wickets, whereas seven spinners have done in it in 12 or fewer Tests. "Might b debatable but for me the best bowler across all formats and conditions... Jasprit Bumrah.... You beauty"
"In the next few months, Bumrah will be the No. 1 bowler in all formats." Long before the tampering saga deflated and weakened Australia, South Africa needed to overturn the 0-1 deficit in Port Elizabeth to keep their chances alive for a first home series win against Australia since 1970. Rabada picked up two disciplinary charges in the Test but also two five-fors. The second-innings effort was a raging display of reverse swing that removed Usman Khawaja and Mitchell Marsh - either side of stumps on day three to flatten Australia as they pushed to set a challenging target. Yasir did something that hadn't happened in Dubai for a long time - he brought the game alive on the third day. Until the start of his deadly spell, things had looked normal - Pakistan had made 400-plus at 2.5, New Zealand had begun with a 50-run stand. Then, Jeet Raval dragged Yasir on and gave him an opening. The legspinner used that to take all of the next three batsmen in the same over: three spitting legbreaks, but none as pleasing to the eye as the one that took Ross Taylor's off stump, having pitched outside leg. From 50 for no loss, New Zealand were bowled out for 91 and went on to lose by an innings.